Motorola has unveiled its latest G7 series of budget and mid-range smartphones at an event held in Brazil today. The latest update to the G series includes newer design, inclusion of a notch, better cameras and slight improvements to the internals. The Moto G7 phones will first go on sale in Mexico and Brazil, starting today. The pricing details were announced at the event, including availability in other regions. 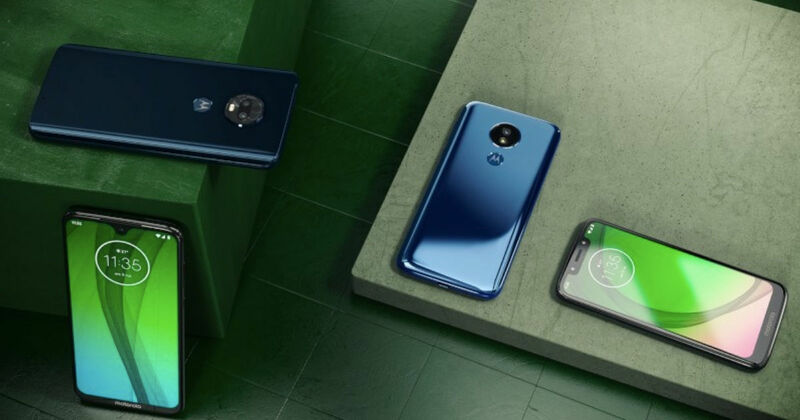 According to the company, the new Moto G7 series will be available globally later this month. In this post, we are going to talk about the major differences between the four new smartphones, the Moto G7, Moto G7 Plus, Moto G7 Play and the Moto G7 Power. Each one of them has one feature that the others lack. Alright, let’s get to it! In terms of pricing, all of the Moto G7 phones are quite affordable. The Moto G7 Play is the cheapest of the lot and is priced at $199, which is around Rs 15,000. The Moto G7 Power is priced at $249 (~ Rs 18,000), the Moto G7 will be sold at $299 (~ Rs 21,000) and the Moto G7 Plus gets a European price tag of €299 (~ Rs 24,000). The G7 Plus will only be sold in select regions and will not make it to the United States. All four phones are available for purchase today in Brazil and Mexico, with shipments arriving in several regions of Europe and Asia mid-February. Motorola will most likely sell all the four models in these regions. The Moto G7 Play, Moto G7 Power and Moto G7, all use the Snapdragon 632 chipset. On the other hand, the Moto G7 Plus gets a slightly more powerful Snapdragon 636 processor. Yes, these are an upgrade over last year’s Snapdragon 450 chipset, but other similarly priced phones from Xiaomi, Honor, OPPO, Realme etc all pack better processors. All devices also run on the latest Android 9.0 Pie software with some extra features such as Moto Display and Moto Actions. Now, let’s talk about the differences in hardware between all the four Moto G7 variants. Starting with the Moto G7 Play, this phone has a plastic body and features a 5.7-inch HD+ display with a wide notch at the top. It also features quite a bit of a chin at the bottom with the Motorola branding. All four devices feature a chin with the Motorola branding at the bottom, but the chin does get thinner with the top variant. The Moto G7 Play has 2GB of RAM, 32GB of internal storage and a 3,000mAh battery. It gets a 13-megapixel rear camera and an 8-megapixel front camera with LED soft light. The Moto G7 Power has a larger 5,000mAh battery, which is the main selling point of this device. It gets a 6.2-inch HD+ display with a notch at the top, which is smaller than the one on the G7 Play. As the price increases, the notch gets smaller. It comes with 3GB of RAM, 32GB of internal storage, a 12-megapixel rear camera and an 8-megapixel front facing camera. Coming to the Moto G7, this phone has a 6.24-inch Full HD+ display with a waterdrop notch at the top. It gets 4GB of RAM and 64GB of storage along with a 3,000mAh battery. On the imaging front, there’s a dual-rear camera setup with a primary 12-megapixel sensor that is paired with a 5-megapixel unit. There’s an 8-megapixel camera in front for selfies. Finally, the Moto G7 Plus has the same 6.24-inch inch Full HD+ display with the small notch, but gets a more powerful Snapdragon 636 processor. It also gets 4GB of RAM and 64GB of internal storage with a 3,000mAh battery. In the camera department, the phone packs a 16-megapixel + 5-megapixel dual camera setup at the back and a 12-megapixel unit in the front. Next articleMoto G7 Plus vs Redmi Note 7: which upcoming mid-ranger should you wait for?